The USCCB announced today that Mary Mencarini Campbell has been appointed director for the Catholic Home Missions and associate director of the Office of National Collections of the United States Conference of Catholic Bishops. The official news release states she "is best known for her untiring love and dedication to the Church." Catholics, unlike Mary Mencarini Campbell, don't give to pro-abortion PACS, they don't support pro-death candidates, and they don't support organizations that hate the Church and everything for which it stands. That official statement about Mary Mencarini Campbell is itself evidence of the deep malevolence that permeates the USCCB. Many Catholics, ourselves included, will not give to any USCCB national collection or a local bishop's appeal because of just these kinds of agents who work like cancer cells within the Church's own bureaucracy. It has been a self-perpetuating bureaucracy since Cardinal Bernardin first installed leftist ideologues and transformed its mission. 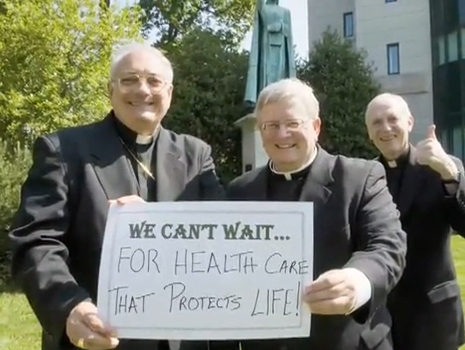 American Catholics now have yet another reason to boycott USCCB collections. Perhaps when even more Catholics have been alienated from their Church because of the USCCB's far-left agenda, the funding for this apostate bureaucracy will dry up. In the meantime, Archbishop Dolan would win the enduring admiration of millions of Catholics by clearing out his corrupt organization, ending its political and legislative agenda (which is ineffective anyway) and focusing a small, dedicated and faithful staff on the reevangelization of society and the salvific mission given the Church by Christ. If anyone doubts that this bureaucracy works at cross purposes with the Pope, take a ride through the USCCB parking lot next Fall and count the Obama bumper stickers. And what have they received for being the obedient lapdogs of the Democrat Party? Nothing but contempt. If Archbishop Dolan would like to clean up this cesspool, we will gladly provide damning specifics, starting with the Office of Education. Mary Mencarini Campbell, who has been named director for the Catholic Home Missions and associate director of the Office of National Collections of the United States Conference of Catholic Bishops (USCCB), contributed $252.40 in September 2004 to an organization led by the president of Emily’s List, according to federal election records. Campbell made her contribution to Americans Coming Together, an organization led by Ellen Malcolm. “Americans Coming Together’s creation is further evidence that mainstream America is coming together in response to President Bush's extremism--on the environment, reproductive choice, workers’ rights, civil rights and other critical issues,” the National Catholic Register quoted Malcolm as saying in 2003. Emily’s List, which Malcolm founded and also led at the time, exists to elect “pro-choice Democratic women,” according to its web site. Campbell served as program coordinator for the USCCB’s Secretariat for Evangelization and Mission from 1994 to 1998. She worked for the Catholic Campaign for Human Development from 1998 to 2007, serving as resource development specialist from 1998 to 2002 and coordinator of resource development from 2002 to 2007. Since 2007, she has served as the USCCB’s assistant director for promotions.